Fanny is a difficult hero, but you can learn how to play or you can search at Mobile-Legends.Net which items can buy for her. Hey this post from “Wo.Nai”, Thx! So, first of all, the history lesson. From that time iFlekzz posted his Fanny guide, lots of things changed. Fanny history is mostly a history of nerfs. The famous “Fanny bug” was removed in patch 1.1.46. If anyone wanders what is “Fanny bug”, well.. it’s basically zero cooldown, energy-free rope->tornadoes trigger, shooting rope to the wall near you, while standing on enemy. That could be only achieved while in blue rune(it gave 50% mana discount for every skill, so yeah, twice cheaper skills for Fanny). This allowed to kill turtle at lvl4 (basically, on it’s first respawn), and sometimes to do wonders in teamfight (you need approx 4-5 tornadoes to kill most characters, so infinite tornadoes kill everything around in a second). Was it a bug, really? I guess nope, I’ve found old patchlist dated 05 november 2016, that introduced new mechanics. So, do the math with blue rune and cost reduction – and voilla, infinite tornadoes for free. All 1.1.46 patch had to do is lowering energy cost reduction from 2 to 1 to make this impossible. Second big hit was blue rune itself. Now it lowers energy cost 20%, not 50%. 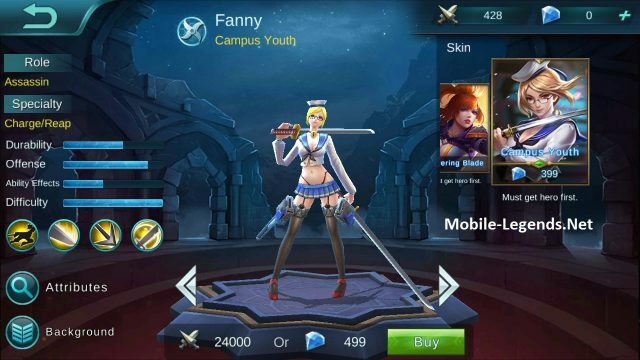 So, if you want to play Fanny now, you must adapt. First thing to note – you cannot play old rope->tornado game. You just don’t have energy for that sort of plays today, infinite tornadoes are no longer infinite, and blue buff doesn’t give you ability to unload more than 4 tornadoes. It doesn’t mean your skillset is completely worthless, you can still do rope-tornado ult tornado rope-tornado combo kill for weaker or damaged enemies, killing them in a flash and running out on ropes. You just can’t carry the game killing only weak or damaged enemies(and have like ~15 seconds when you are useless afterwards, waiting for your energy to regen). What you should do today, is get rid on Interference in abilities, get Fury, and full pack AD/Crit, instead of old full AD(to buff skill damage) + survivability(to do more tornadoes). Why? Because you still have the best movement ability in the game, and your autoattacks are goddamn fast and damaging. You outdamage ADCs, just need to think about how to get to enemy ADC as fast as possible, without getting CCs and other enemies being distracted with something else. Your gameplan is to kill their damage source, horribly crippling enemy team. Tooth of Greed. This is always a first item, as with your high damage it allows you to heal in jungle, and even more that that – on empty lanes. Blade of Destruction. High attack damage, top +crit, absolutely musthave unique. Scarlet Phantom. This one isn’t obvious, because of how low AD it gives. But it packs a whooping +75% asdp after crit, which is is now 30% (40% after crit). So, every ~3-4 attack you proc passive, and that makes jungling really fast. Blade of Destruction. Yeah, again. Because no items give AD/Crit better than this one. You need both: AD to damage from skills/AA, crit to proc Scarlet Phantom. Wind Chaser. If anyone stacked defence, it’s no longer relevant. Blade of Despair / Blade of Destruction / Immortality. My preference is Despair, but you might have your own thoughts about damage/survivability. Skill order: Always ult, Always tornado, ropes the rest. 1: Tornado. AoE around you, deals much damage, don’t stop autoattack animation. When you fly through the enemy on rope, you trigger Tornado skill (it costs energy too, so don’t waste that on creeps if you plan to kill someone). I will call it Rope->Tornado. 3: Instantly teleports you to the most damaged enemy in pretty big range around you, deals much damage (even more if you Rope->Tornado’ed him before, stacking up to 2). You should exp hard. Your character toolkit allows to do it with no pain, and it helps greatly to be 1-2 levels above (given, your prey is ADCs, that also jungle). If you have other options, don’t go solo-mid. Best option is to duo-kill your top camp fast(use Fury), then go to the lane. Bottom camp is worse, but since blue rune nerf, it isn’t MUCH worse. One hint about top camp: you can hit both monsters at the same time. Hit top monster, rope to rune monster, go to the middle. It makes jungling much faster. Just don’t forget to meet them in the middle, so no monster decides that he wandered too far. As you may note, Fanny is all about how good she is with ropes. So let’s see some tricks. First of all, you should know about doublerope forward movement. Did you ever watch Attack on Titans? Well, they dont just throw one rope to the wall, they throw left and right rope, so they can fly on them in the middle. Same trick works in this game: you aim first rope forward-left wall, then without any delay, second rope on forward-right wall, and BOOM – you fly in a straight line, much faster than you fly single rope, and much futher.Try not to hit towers with yourself, as it will slow you down. Be wary, doublerope movement can result in you getting stuck in textures (mostly in the jungle). You should also know the timing of additional ropes(ropes you shoot while you fly). When you shoot additional rope at the end of the movement, your additional rope will be quickly dismissed. It happens because you fly the same time you would fly on your first rope. So if you want to move for a long distance, shoot additional rope at the beginning of your movement, but if you want to slightly change the place where you land, do it just before the wall. You can even shoot the rope 180 degrees from first rope, so you don’t end you movement at the wall, but rather in the middle between walls (where enemy stand, for example). Sometimes, it’s better to single-rope till the end. Generally, when you want to do damage from tornadoes, don’t doublerope, wait till you hit the wall to reset main-rope (if you shoot rope just before you hit the wall – it’s dismissed and your energy is gone). As for now (1.1.54), if someone stuns you on rope, you fly all the way till the end. If you know that someone sits on their CC, you may try to bait it: Fly to them, rope out as far as you can. Just be wary: Yun will get you out of your rope to the place behind him, no matter what. You should always try to end your movement in the bushes. That way you are much more evasive. You should know what you are doing before you do it. Sometimes, you just want to kill creeps. If you can, just walk in and AA+tornado (might even do that against enemy, lifelink compensates). If it’s dangedous, you can act like you are trying to kill them, while you just tornado-rope creeps (tho hitting opponent several times in a process; do note that this works in lategame too, as inhibitor tower protection, just need to run out fast). After that, you rope out (and may go jungle before next wave, ping “request backup” so your ally don’t lane without you). There is one thing to note as Fanny player, you should learn to rope-dance just before their tower range, rope to upper wall, rope down, rope up to bushes. 2-3 tornadoes at the beginning of the game is ~60% hp damage. When enemies run to their tower and have no CC, you might try to waste full energy bar to put them far behind on health, forcing them to go to the well or to risk being killed (see below). Sometimes, you see damaged enemy. The best combo is rope->tornado ult(before you hit the wall, from rope) AA tornado rope->tornado. If executed fast, you can even dive to the tower to do a kill (watch out for CCs). Sometimes, you see an enemy that wandered too deep, and you can kill him before his allies will help. Jump in with ropes (yeah, those alone), enter Fury, AA + tornado. When he runs out (you have no boots, remember?) catch up with rope->tornado into ult (into AA, if needed), or just ult if low on energy. Same tactics for the endgame ADC hunt, actually. But instead “too deep to your territory” it’s sometimes “too deep in behind, when others dive on your team”. Just doublerope forward straight to them, ignoring the battle. Try at all costs to avoid CCs. Don’t dive before you’ve seen all AoE CCs. If none of above applies, just find the place where your presence is the most beneficial. You may push some empty lane before you allies gather for the teamfight, and dive in after all the CCs are shot. Or you may act as scout, looking for enemy movement from afar&bushes, relying on your ropes to get out before they get close (and kill badly-positioned enemies in process). And the last. You have ability to move fast. It means you choose the fights, when and where. Don’t waste your best ability, don’t chose the fights you will not win. It doesn’t mean you shouldn’t teamfight, just be sure you know you can change something (quantity of alive enemies, for example) when you do it. Special Thanks, “Wo.Nai” , very good post. Thank you so much! So you do not need a boots? my fanny is cant use why??? 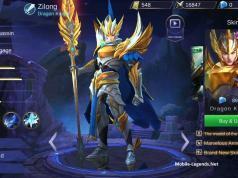 I bought fanny yesterday but why can’t I use her? Does mana items affect fannys energy? Do You still get blue?